Tuesday morning came as a wet cloudy affair. I spent the morning getting caught up with my work. Just before lunch I looked out the window to notice that it had stopped raining. There was a mist to be seen and the wind was almost non existing. With a quick lunch, I loaded up my gear and headed up to Paradise Lagoon. As I traveled the Matagamasi Road I stopped here and there to capture various scenes that attracted me. The humidity was high. It was a bright cloudy day. Everything was wet and there was a mist in the air. This made for some intense colors. The forest vegetation is changing color now. As I was photographing by a lake, a truck came around the bend in the road. They stopped and I was asked if I knew the way to Wolf Mountain. Giving them directions I told them I was going to Paradise Lagoon. If they liked I would take them there. I loaded up my gear and off we went. We soon arrived at the side road and parked. Loading up my gear I lead the way up the bush road to the trail that takes you to Paradise Lagoon. Being so humid we were all soaked from sweat and the water coming off the trees. After our arrival and quick look around we parted company. The above shot was a location that I wanted to capture previously. Due to high water I was not able to. I removed my running shoes and socks, but then after observing the rocks in the water I decided to put my running shoes back on. There was some pretty sharp looking rocks under the water. Using my tripod as a walking stick I cautiously waded the stream till I was in position. I now was knee deep in water. The intensity of the rock colors was vibrant There is enough greenery to offset that with the water being on the dark side due to the cloudy skies. The water felt good running around my legs and was not cold. No matter how many times you return to a location there is always something new to find. The lighting is different. The water levels change and the various seasons have an effect. Well that is it for this week. I am busy getting ready for the Anderson Fall Fair this Saturday. The Anderson Farm Museum is located in Lively Ontario. I will be set at the stable with my work from 10 to 4. So if you are in the area stop by for a fun time. My running shoes are still drying out from the episode in the river, but I got the photo that I wanted. In this photo a unique lighting has been created. You have the lighting from the late evening sun drenching the rocks in the background. Thus creating an orange like hue on the rocks. The rocks in the foreground are now darker for the sun no longer affects them. But there is still a touch of lighting on the rocks to the left. This is what helps to add character to a composition. It is the little detail. There is a nice green tinge to the water in the foreground. This is due to the sun striking the evergreens on the far bank and reflecting on the water. If it had been a little earlier the water would be a golden color due to the stronger strength of the sunlight. This week I received an Award of excellence for one of my compositions. You can see the selected works here. Last Fall Paul Smith and I were wandering along the Wakanasin River. Paul and I had looked at this scene many times but could not put it together. We looked at it during many seasons other than Winter. Up the Westbranch there is not a lot of Maple and Oak for the red and orange Fall colors. There is mostly Evergreens, Birch and Poplar in this part of the country. I stepped out in the water to set up this composition. Having placed the tripod and camera I set about composing the above scene. There was cloud cover, which cut the glare of the sun on the running water. You can just make out some reflection, reddish orange on the right in the crystal clear water. Well that is it for this week. Until next week, happy Trails. Tuesday morning arrived to the sound of wind in the trees.This was a morning to sleep in.It was an uneventful day as we waited for the weather to change.On Wednesday morning we were able to put in some photographing time.As we paddled the shorelines I was looking for something different to work with.I particularly wanted to find some Fall colors in among the evergreens.I was able to achieve that with the above composition. 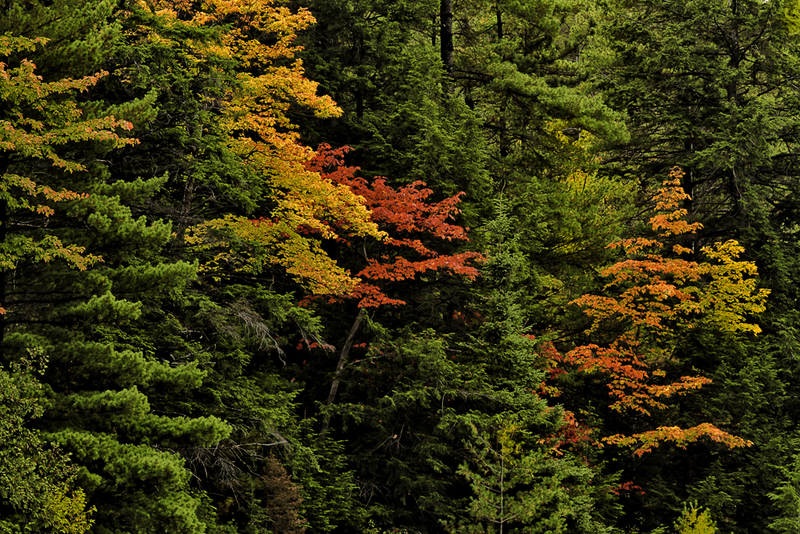 Here you have a mix of orange,red and yellow for Fall colors nestled among the evergreens.When I first saw this I was straight on to the composition.By moving more to my left and setting up my Canon 7D on the tripod I feel I would give the scene a more 3D effect .The evergreens show various shades of green and there are shadows to create more depth. I think that this photo printed on canvas as a gallery wrap in say a 24″x36″ size would look great on the wall.It will give you peace and harmony as you envision being on a far shoreline observing the scene before you. Well that is it for this week.I will finish up the trip early next week.So until next time happy trails.